Purchasing a new home sewing machine is exciting. Whether you have graduated to a new level of sewing or this is your first machine, it can be intimidating to learn how to use the new machine. Threading a new home sewing machine is the first thing to learn. All machines thread similar to each other, with a few differences according to the manufacturer. Wind the bobbin by placing a spool of thread on to the spool pin or thread holder, on the top of the sewing machine. Place the empty bobbin onto the bobbin winding pin on the top right of the machine. Wrap the thread securely around the bobbin six times by hand. Slide the bobbin-winding pin to the right until it clicks in place. Slide the thread from the spool end securely under the tension pin on the top left. Press the foot petal to wind the bobbin. Cut the thread when the machine stops. Thread the machine by unwinding a 12-inch length of thread and hold it securely close to the spool of thread with your right hand. Wrap the thread behind the thread guide on the left of the spool pin, with your left hand. Draw the thread down and under the thread guide, then back up and over take-up lever, and down again. Gently pull on the thread to remove any slack. The thread guide and take-up lever connects the thread to the upper tension wheel, keeping an even pull on the thread as it passes through the machine. Release the thread from your right hand. Slide the thread into the needle bar thread guide on the needle assembly. The needle bar thread guide is a bar with a slot or a ring with an opening for the thread. Thread the needle with the needle threader. Older sewing machines do not have a needle threader; thread them using a hand needle threader. Open the bobbin casing door and set the bobbin into the bobbin case, leaving a 6-inch tail. Close the bobbin door. Turn the wheel on the right side of the machine forward by hand to lower the threaded needle down into the bobbin case. Continue turning the wheel until the needle returns to the highest position. This will bring the thread tail up from the bobbin. Pull the tail up and out with your fingers. Slide the upper and lower threads under the presser foot. Set the fabric under the presser foot, then lower the presser foot lever. Hold both threads and press on the foot pedal. After sewing five to six stitches, release the threads. Sew a test strip on a piece of scrap fabric to check the stitching. Turn the upper tension dial to the left to adjust the tension. The higher the number, the less tension there is on the stitch. Match the needle size to the thread size. Use a seam ripper or small scissors to help grab and pull the thread up from the bobbin case. Be sure to use sewing machine thread instead of hand sewing thread. 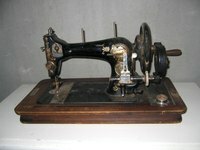 How Do I Thread My White Sewing Machine Model 1866?